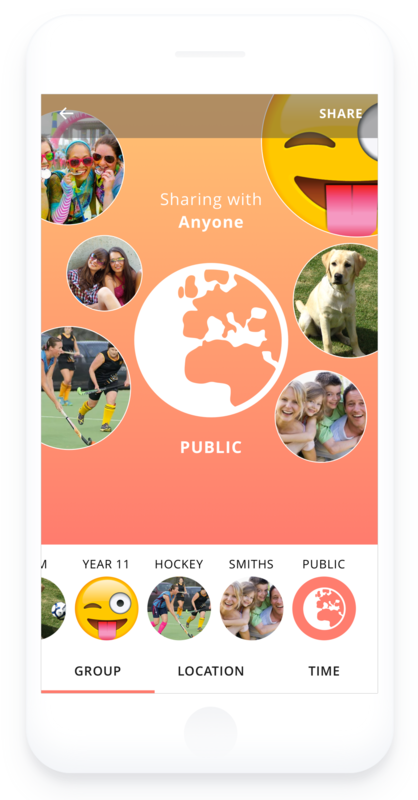 Designing apps that visualise the complex privacy options available when sharing content will make it easier for teens to understand and control their data. Loco is a fictional image-sharing mobile application. Loco connects people to ephemeral media created by people nearby, and selected brands. Location-tracking, which occurs in the background and stores a record of places you frequently visit to notify you of content created nearby that you might like. This includes posts by friends, people you might like, and selected businesses. Content you post to Loco is visible to your followers for just 24 hours. It is also stored for you in a private archive indefinitely. Teens are a sophisticated group of digital users. They are generally more aware of issues related to data transparency and trust online than their parents are and have a heightened awareness of the risks of sharing their location with strangers. They also understand that data is only meaningful in context and want to have granular control over how their personal data is shared. This is especially true of older teens as they start to participate in more social groups. Putting them in control of managing those different relationships gives them a feeling of self-sufficiency and independence. ...empower young people with granular controls? While sharing content on Loco, teens have the option to choose whether to share to one group, many or publicly. Visualising the increase in audience scale conveys, in simple terms, the reach of the data to be shared. When sharing content on Loco, teens have the option to choose whether to share location or turn it off completely. The simple slide control and the resulting changes on the map help them make better choices about the location data they are sharing, from a broad region down to a specific road location. The team used an interaction pattern common to the interfaces of cameras and photo-sharing apps to keep it simple. The result gives the effect of applying privacy settings as a new type of filter to shared content. When sharing content on Loco, teens can control how long content will be shared for. Using a simple slide control, they can share content from as little as 1 minute to a maximum of 24 hours. Visual feedback and clear text ensures that people are more aware of the longevity of their data. Team member Vicky Chang, Technical Program Manager at Facebook, said, 'design choices that visually illustrate a post's audience members or length of ephemerality will bolster users' fundamental understanding about the privacy of their posts. These fundamental mechanisms in apps are becoming universally understood and valued'. People - An easy way to see who's inside the 'Scouts' group, so people can be sure it's who they'd expect. View As - Gives an overview of what the people in the 'Scouts' group can see, and for how long. Explore more contextually driven interaction choices on content? Explore other familiar interaction patterns from commonly used apps and apply those to privacy, e.g. sliders, swipe left/right?